The police monitoring of the activities of Occupy Boston -- an off-shoot of the Occupy Wall Street protests that swept the country in 2011 -- came during a period after the U.S. government received the second of two warnings from the Russian government about the radical Islamic ties of alleged Boston Marathon bomber Tamerlan Tsarnaev. Boston Police Commissioner Ed Davis told a congressional panel Thursday that his department was never alerted by any federal agency to the information about Tsarnaev, but added that it was "hard to say" whether it would have made any difference in preventing the bombing. FBI officials have insisted that the intelligence about Tsarnaev was vague and uncorroborated and that their own assessment at the time produced no "derogatory" information that justified opening a full-scale investigation. But the internal Boston police documents, recently obtained by a civil liberties group, could raise fresh questions about the role of Homeland Security-funded "fusion centers" like the Boston Regional Intelligence Center, or BRIC, which conducted the monitoring. The Boston unit is one of 72 such units set up to collect, analyze and share intelligence about potential terror threats. While Homeland Security Secretary Janet Napolitano has called the units “one of the centerpieces” of the nation’s counterterrorism efforts, congressional critics have questioned their effectiveness and accused them in some cases of writing "useless" reports that infringed on civil liberties. “They were monitoring completely lawful activities,” said Mara Verheyden-Hilliard, executive director of the Partnership for Civil Justice, a civil liberties group that recently obtained the documents on the BRIC’s monitoring of Occupy Boston under the Freedom of Information Act. She said the BRIC monitoring was an example of the “vast expenditure of government money” to collect intelligence on activities unrelated to terrorism, in violation of First Amendment rights. The internal police documents about the activities of the BRIC show that on Sept. 30, 2011 — just two days after the second Russian warning about Tsarnaev was sent to the CIA — the Boston police unit was focused on an upcoming “Take Back Boston Rally” planned for the city’s Dewey Square. 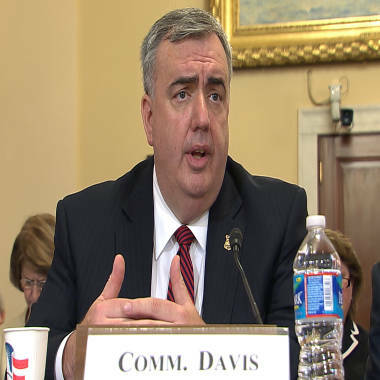 Boston Police Commissioner Ed Davis testifies Thursday before a House committee on the marathon bombings. In his testimony Thursday, Commissioner Davis acknowledged to a House committee that his department, which runs the BRIC, was never provided any of the intelligence from the FBI and CIA that Tsarnaev, a resident of Cambridge, had been twice flagged by the Russians as an Islamic radical with ties to “underground” groups in that country. Davis acknowledged that police counterterrorism detectives were assigned to an FBI Joint Terrorism Task Force (JTTF) -- a separate unit from the Homeland Security fusion centers that serves as the government's primary investigative arm for probing terror threats. An FBI agent at the Boston JTTF conducted an “assessment” of Tsarnaev in 2011 after the first warning about his ties was sent by Russia’s FSB intelligence service. The assessment found no “derogatory” information about Tsarnaev that justified conducting a formal investigation. Later information about Tsarnaev included a second Russian warning to the CIA on Sept. 28, 2011. FBI spokesman Jason Pack said Thursday that state and local members of the JTTF are “responsible for maintaining awareness of possible threats” in their areas and could have performed “customized key word searches” of the FBI database that would have yielded the information about Tsarnaev. NBC News researcher Taylor Sears contributed to this report.